Flint was found dead at his home in Essex on Monday morning. He was 49. Singer Blunt wrote on Twitter: “At the Q Awards years ago, when @NoelGallagher was saying he was leaving Ibiza because I’d moved there, and @DamonAlbarn refused to be in the same picture as me, and @PaulWellerHQ was saying he’d rather eat his own s*** than work with me, Keith Flint came over, gave me a hug, and said how thrilled he was for my success. Many famous faces have posted messages on social media following news of the star’s death. The presenter simply wrote the word “heartbroken” on Twitter. 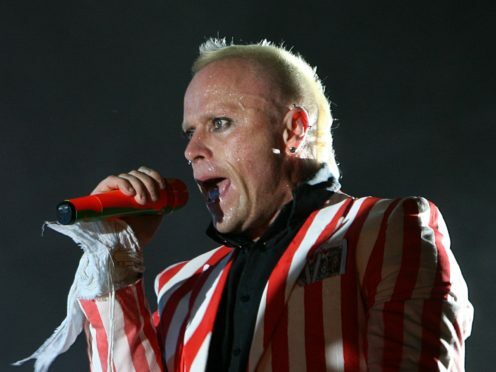 Boy George said: “Shocked about Keith Flint from @the_prodigy what a waste of a vibrant frequency. Shocked about Keith Flint from @the_prodigy what a waste of a vibrant frequency. Had lot's of fun times with Keith. R.I.P. Rapper Professor Green posted a series of images of Flint on Instagram, saying he had played the group’s music “as a young teen going through some of the most pivotal points in my life”. He also recalled seeing Flint at the Brixton Academy in 2009, which he said was “the best gig I’d ever seen, and still is till this day”. Ed Simons of The Chemical Brothers also shared a memory of Flint on Instagram. Along with a picture of himself and bandmate Tom Rowlands on stage with Flint, Simons wrote: “Such sad news about Keith Flint. This is him unexpectedly joining us on stage in 1995. “He managed to kick the power out but no one minded he was Keith from the Prodigy and he could do whatever he liked. Glastonbury co-founder Emily Eavis wrote that The Prodigy were the first dance act to play the music festival more than 20 years ago as she shared a message on Twitter. BBC Radio 1 presenter Nick Grimshaw recalled a “life-changing moment” in his youth when seeing The Prodigy as his first gig. He wrote on Instagram: “Such a big part of my formative teenage years, posters on my wall, learning the lyrics on the bus home from school and torturing my parents with Fat Of The Land. Pop duo The Ting Tings said Flint was an “original pioneer”. Oh no….. Sad sad day! Lost another Original Pioneer. RIP Keith Flint. Flint’s Prodigy bandmate Liam Howlett claimed in a post on the band’s official Instagram that “our brother Keith took his own life over the weekend”.